Installation view, Ca' Pesaro, Venice, 2016. Photo by M. Sereni. Richard Saltoun Gallery announces the first UK solo exhibition of Italian sculptor Eliseo Mattiacci. The exhibition will present one of the artist’s most important and dramatic sculptures of his career: Roma. 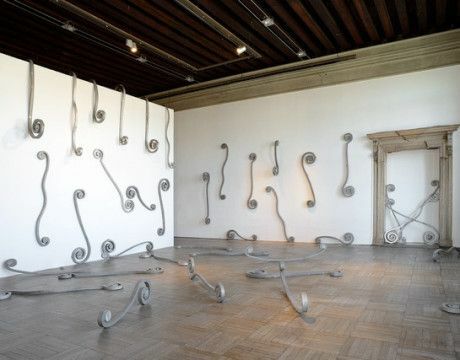 Conceived in 1980-81, this momentous installation comprises 58 moulded aluminium volutes, occupying the three rooms of the gallery and in dialogue its Georgian architecture. Mattiacci is one of the great Italian post-war artists. Now in his late 70s, he has spent the past 50 years using sculpture to question, examine and explore the mysteries of the cosmos and mankind’s relationship with the universe. In 1964 Mattiacci moved to Rome where he was involved in the renewal of contemporary Italian art. Though he was in contact with many artistic movements, from Arte Povera to Minimal Art, he developed a unique and personal practice with a fearless and independent trajectory.